"So for Christmas I received an Instant Pot® and immediately thought how cool. I had heard about them in podcasts that I listen to, but then thought will I really use it? Yes! I love it... cuts down cook time and everything is super tender and flavorful. I am a fan! 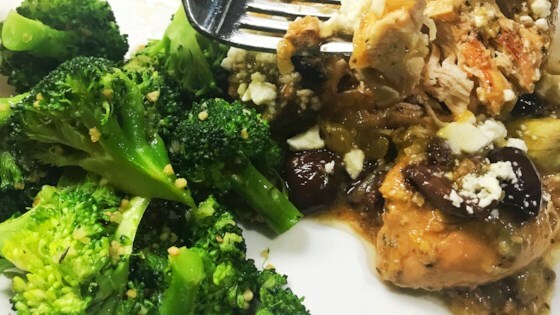 This Greek chicken was done in no time!" Select the Saute function on your multi-functional electric pressure cooker (such as Instant Pot(R)). Add oil and roasted garlic to the pot; cook and stir until fragrant, about 1 minute. Season 1 side of chicken breasts with 1/2 of the garlic and herb seasoning, garlic salt, and black pepper. Place chicken in the pot, seasoned side down. Cook until browned, about 2 minutes. Season the top with the remaining garlic and herb seasoning, garlic salt, and black pepper. Flip and cook until other side is browned, about 2 minutes. Arrange artichoke hearts and olives around the chicken in the pot, filling in any gaps on the bottom and on top of chicken. Top with red onion. Pour dressing over chicken. Close and lock the lid. Select high pressure according to manufacturer's instructions; set timer for 15 minutes. Allow 10 to 15 minutes for pressure to build. Release pressure carefully using the quick-release method according to manufacturer's instructions, about 5 minutes. Unlock and remove the lid. Remove chicken from the pot. Add arrowroot starch to the liquid in the pot and whisk until combined. Return chicken to the pot. Allow sauce to thicken, about 3 minutes. Sprinkle with additional salt and pepper and top with feta cheese. See how to make Greek-style pasta with chicken and artichokes. I made it pretty much “as is” other than I kept the olives whole and roughly chopped the onion. Delicious! I’ll make it again. Fairly new to the Instant Pot, so I followed this recipe with no changes....AND LOVED IT. Served it over cheese toast as an open-faced sandwich. Will definitely make again in the near future.